Tools: Floor or other jack, jack stands, 1/4", 3/8" and 1/2" drive metric sockets 10, 12, 14 and 19mm wratches and wrenches, large breaker bar, harmonic balancer remover or other puller, two 6mm x 70mm thread pitch 1.00 bolts. 1) Remove the alternator, tear down the front of the engine and remove the timing belt. See link above. 2) Drain coolant by opening the radiator petcock. But expect some minor loss of coolant during later parts of this procedure. 3) Remove the timing belt tensioner and spring. 4) Remove the idler as it is in the way of removal of the pump. 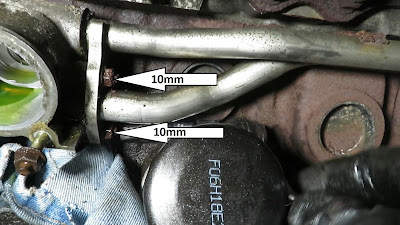 5) Remove the alternator mounting bracket (12mm) and separate the connected wiring. 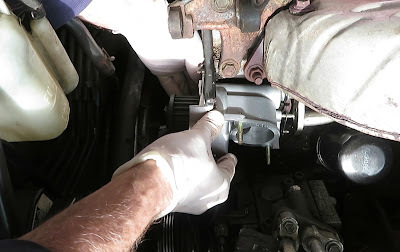 6) Remove the upper radiator hose by pulling the clamp back and pulling it off. This is where some coolant loss will occur. 7) Remove the plastic piece of pipe housing the thermostat (two 10mm nuts) from the water pump. 8) Remove two 10mm nuts holding a bracket for the two outlet pipes to the right of the pump. I used a 1/4" ratchet and 2 inch extension and a "U" adapter to get into the tight lower spot. 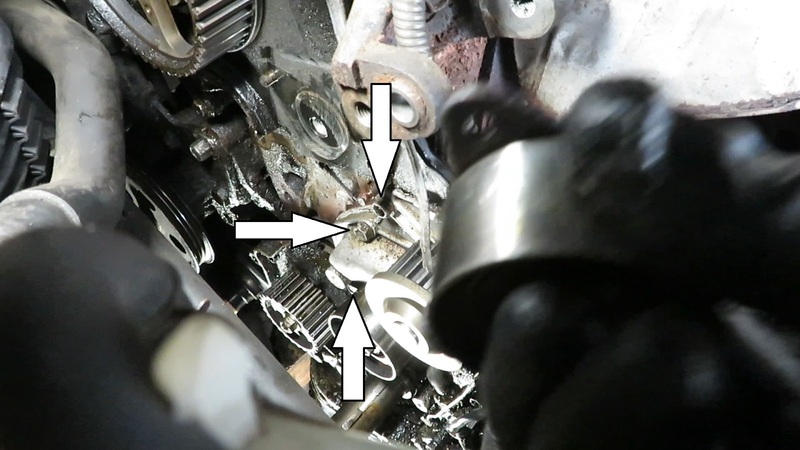 9) Unbolt three 10mm water pump to engine mounting bolts. These are easy to access but note, several nearby bolts on the pump only hold the two pieces of the pump together. Don't remove those. 10) Pull the pump off the engine. It may take some jiggling to separate the pump from the outlet pipes. 1) Seat the small o-ring on the upper steel outlet pipe. Just a touch of grease on the outside diameter of the o-ring will help new pump slide over it. 2) Seat the larger o-ring into place in the groove on the pump where it mounts on engine. 3) Seat the flange-type gasket on the water pump where the lower steel pipe mounts on the pump housing. 4) Check the engine mating surfaces with the pump and clean if necessary. 5) Mount the pump. Slide it over the pair of outlet pipes. When seated fully, turn in the three 10mm mounting bolts, evenly by hand. Snug up. Tighten the two 10mm lower outlet pipe nuts. Torque the three mounting bolts now to 78 in lbs. 6) Mount the thermostat housing and thermostat with two 10mm nuts. This is a good time to install an new thermostat. 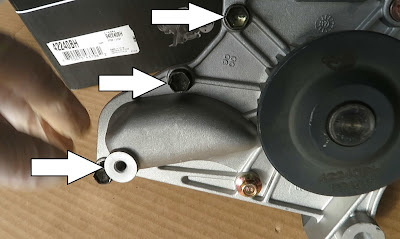 Do not over torque these on the plastic housing. 7) Install the upper radiator hose and clamp. 8) Mount the alternator bracket, loosely for now, with a 12mm bolt. This will fully torqued later when the alternator is mounted. 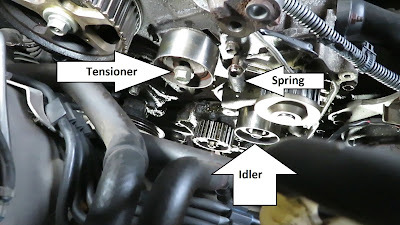 9) Reinstall the timing belt and the rest of the front of the engine. I will tell you about my weakness: I love to play games of chance, especially roulette. Now there are many online sites for playing for real money, but my opinion fell on this casino rapid roulette bets Winning at a casino is almost impossible, but having a good time is easy.